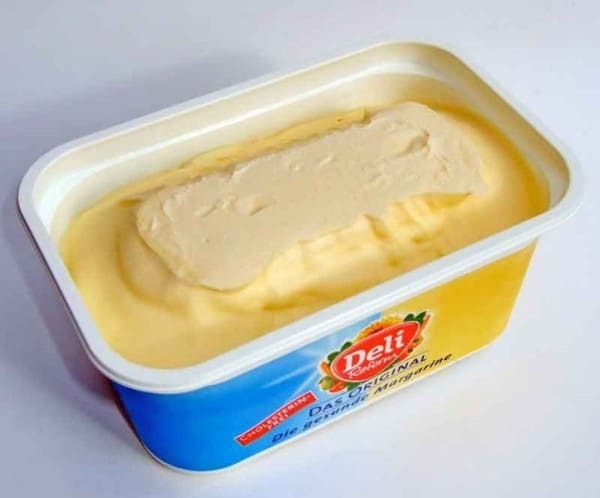 Home » Miscellaneous » CopyKat Answers – What is Oleo Margarine? CopyKat Answers – What is Oleo Margarine? I actually get asked this question very frequently, what is Oleo? A lot of older recipes call for Oleo. We all love recipes that we grew up with, but sometimes they have unfamiliar ingredients. You may love digging through old recipes too, but you have to wonder what some of these ingredients are. I actually get asked this question very frequently – what is Oleo? A lot of older recipes call for Oleo. We all love recipes that we grew up with, but sometimes they have unfamiliar ingredients. You may love digging through old recipes too, but you have to wonder what some of these ingredients are. Oleo is actually an old brand of margarine. Of course, if you are a regular crossword solver, you are probably familiar with the word – it’s eminently suitable as an answer to the clue “margarine” in four letters because it contains three vowels. Oleomargarine is how this margarine product would originally have been named. Margarine was originally made with beef fat and was intended to be a cheaper and less perishable option than butter. In due course, vegetable oils, such as soybean and cottonseed oils, came to replace animal fats. When Oleomargarine first came out, it wasn’t even yellow; it was white. It came with a capsule of yellow coloring if you wanted your oleomargarine to look like butter. Margarine wasn’t allowed to color itself to look like butter because the dairy industry didn’t want people to confuse it with butter. They went into a big tizzy and managed to get legislation passed against the coloring of margarine. In Wisconsin, the Dairy State, and six other states margarine was actually made illegal. And, three states stipulated that margarine should be dyed a bright pink! Such laws stayed in effect for many years and you can read an interesting article from the New York Times archive about them. Margarine was actually created in 1869 during the time of the Franco-Prussian wars by a French chemist named Hippolyte Mège-Mouriès. His invention was in response to a competition run by the French government under Napoleon III. They wanted a cheap and stable substitute for butter and were offering a big prize to anyone who could pull it off. Fast forward to World War II – margarine increased in popularity due to butter shortages. While butter is a dairy product, margarine today is typically made from hydrogenated vegetable oils, which have been proven to have adverse effects on health. Read more about why butter is better for you by clicking here. So, if you buy margarine, read the ingredients carefully. However, there are other butter substitutes available for those who have allergies to dairy or just wish to eat dairy free. Read about them here. So next time you read an old recipe, and you see an ingredient called Oleo, you don’t have to wonder what it is anymore. You’ll know that Oleo is just an old word for margarine, and you’ll also know that you can swap it out for butter. Of course, your kids will miss out on the fun of adding in the yellow coloring! Here are some CopyKat recipes for you to try! My grandma sent me and my dad to the store with a shopping list that said “oleo.” When we came back empty handed she couldn’t believe we didn’t know that oleo was margarine. It hasn’t been called that since Kennedy, grandma! I have a frosting recipe of my mom and grandma that is really fussy. You have to beat it for 15 minutes and butter doesn’t work as a substitute. Margarine used to work but they keep changing the formulas/ingredients so I can’t find anything that will make this frosting stay together. It gets watery and clumpy instead of creamy and fluffy. Does ANYONE sell an old formula of Oleo? Is there a copycat way to make it myself??? I would try a generic margarine if store still sell that.